Part three is on radar absorbers and absorption mechanisms. You are here, and here is the index to this page! Unfortunately absorbers usually come into the RCS reduction picture after all the shaping is done, but ideally they are an integral part of the design. Absorbers work by allowing the wave to penetrate into a region where the electric and/or magnetic fields experience loss. Apart from Frangencite, Bolognium and Unobtanium, all other materials are constrained by the laws of physics! All lossy materials are frequency dependent, that dependence constrains the values the real and imaginary parts of the relative permittivity ( R) and relative permeability ( R) can take. In our universe we have freely mobile electric singularities called electrons, therefore the quantity called conductivity, , (mhos/m) exists down to DC. Conductivity is a loss mechanism, however it also folds into the material's impedance since -= / 0. Thus a metal ( =107 mhos/m) is both highly lossy and highly reflective. Fortunately we have an abundance of cheap low conductivity material called carbon. It is possible to construct synthetic materials from carbon that can have tailored conductivity, from very poor (insulated grains of carbon black) to very high (connected chains of graphite). The only significant frequency dependence that enters into these synthesized absorbers is that introduced by the insulating resin (binder) between the carbon particles, which acts like a capacitor. Carbon-based absorbers provide essentially an electric field loss mechanism. It is the induced currents that dissipate the energy into heat. The good news is that electric conductivity is a broadband loss mechanism. The bad news is that it has to be placed where the electric field is a maximum. We already saw that on a metallic surface the only electric field is vertical for off-normal incidence and it's difficult to use the vertical E-field for loss, that is, to absorb the wave. or entire domains of electron spins (Lorentz-like). A low-loss permeable conductor (that is one with intrinsically low )- can be made magnetically lossy if it is thick enough for eddy currents to be set up. This dispersion is Debye like. Thicker absorbers (volumetric) are more broadband than surface absorbers. Magnetic properties increase the bandwidth of absorbers. High dielectric constant reduces bandwidth. Magnetic properties are frequency dependent, especially in the UHF to GHz range. 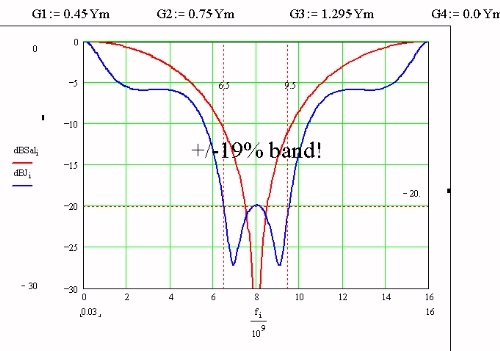 An absorber that is broadband in frequency is broadband in angle; conversely narrowband in frequency implies narrowband in angle. Broadband behavior requires grading the properties from light on top to heavy on the bottom. 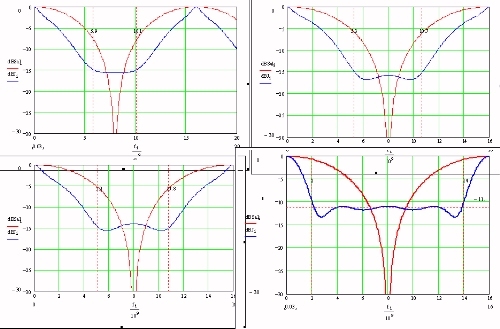 Wideband behavior can be obtained by using transformer/filter design concepts - a combination of interference and absorption. Most absorbers are backed by a conducting ground plane. Graphite reinforced epoxy is one example of this. Most RAS includes an unfortunately thick skin, plus chemical agent resistive coating (carc) plus paint on top; the high frequency behavior of the RAS is controlled by this skin structure. Skin cancellation is possible but it's not pretty. Of course some generalities compete with others. For instance, an absorber that is electrically thin over its whole band of operation tends to behave the same way at all frequencies. High dielectric constant makes kz inside a material independent of angle of incidence so you can get internal behavior that is broad versus angle. A thick homogeneous layer of material has internal resonances that will make its behavior narrowband. Salisbury worked in the MIT RadLab in WWII, and this technique was named after him. An easy way to use the ohmic loss mechanism is layered absorbers. The Salisbury screen consists of a sheet of resistive material placed /4 over ground. Magnetic loss mechanisms are intrinsically narrow band. The Salisbury screen is narrowband in frequency and angle. According to one of our generalities, to get more bandwidth you need to use multiple layers of R-Card separated by dielectric spacers. According to another, the dielectric constant of the spacers controls the maximum bandwidth of the design. The lower the permittivity the larger the bandwidth. But foam and honeycomb spacers give a physically thick sandwich structure. To get a composite skin you can lay up fiberglass and R-card layers and injection mold the whole thing. Johannes Jaumann worked in Germany before and during WWII, check him out in our Microwave Hall of Fame! His absorber design was first used on submarine periscopes to make them less visible to surface ships. The Jaumann absorber can be designed using transformer concepts. Think of it as a shorted transmission line to which a sequence of shunt conductances are added separated from each other by quarter-wave transformers. The result of this approach is a very deep null at center band, and twice the bandwidth of a Salisbury screen, using the same dielectric. To get broadband design, think of the statement of the problem as being: "hide the groundplane." In other words, if we could eliminate all echoes behind the front face of the dielectric, the worst case echo would be the one from the front face of the dielectric. 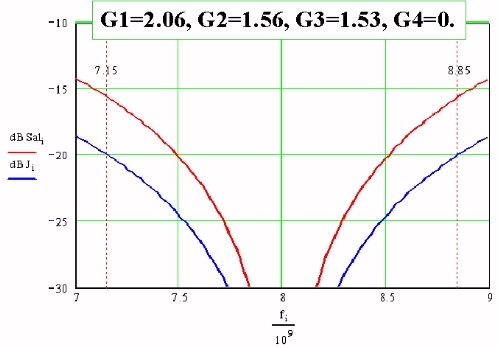 A dielectric of impedance = 0/2 has a front-face reflection coefficient of about '10 dB. Let's come up with a scheme for gently erasing everything else. The approach: imagine the energy entering this material as it passes G3, G2 and G1, hits the groundplane and returns again through G1, G2, G3. Every time the wave interacts with a G sheet it loses energy. How much energy does it lose? Well if you treat it as a local phenomenon (kind of time domain thinking - not frequency domain) then consider a sheet of G in a sea of Ym. In this simple problem T is the transmitted E field at the sheet and therefore that of the transmitted wave behind the sheet. 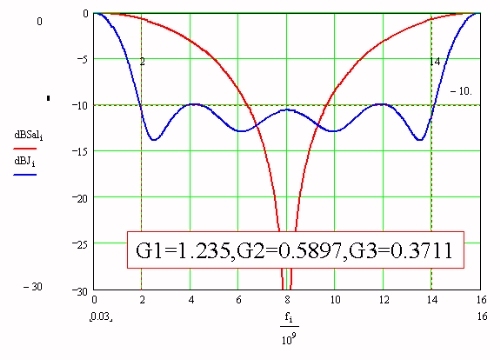 Therefore the power transmitted is lower than the power incident by the factor: P=4Ym2/(G+2Ym)2. At each interface you now have a power loss factor and a local reflection coefficient. Looking at the "ray" that makes it all the way to the ground and reflects back.. Experience with the anti-reflection coating tells us that the way to get deep nulls and good cancellation is to make the various echoes have the same strength so that when they are out of phase with each other they cancel exactly out. 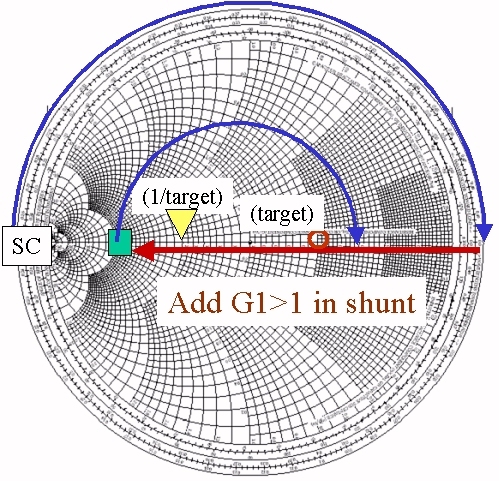 And so there is a closed form procedure for designing "gentle Jaumanns" that reduce the reflection coefficient to that of the supporting dielectric. The Jaumann is broadband in angle as well as frequency. 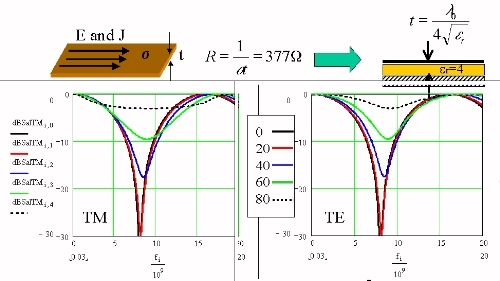 In fact the degradation with angle in TE is simply the increased reflectivity of the TE case of Fresnel's equations. So there is a design procedure, but with exceptions.